With that title, this post could be about my sons. Both are quite the talkers. But, no, this post is about me and my willingness to say "YES!" when someone asks me to speak. Thursday, February 28, Home and Garden Show, Allen County Memorial Coliseum, 5 PM, "Gene Stratton-Porter:Environmental Lessons from the Past"
Sunday, March 2, Allen County Home and Garden Show, 2 PM, "A Homeowner's Guide to Better Water Quality"
Monday, March 17, Huntertown United Methodist Senior's Group, after lunch (prepared by the culinary arts class at Carroll High School, which includes my son), "Restoring the Garden at Gene Stratton-Porter's Wildflower Woods"
Saturday, May 17, Unitartian Church's Garden Party, time unknown, "Jewels from the Past: Gene Stratton-Porter's Garden"
Every Wednesday until the end of April, I am co-teaching a class at church called "Godly Living, Green Living." During the last two classes, we covered scriptural basis and introduced water quality. This Wednesday will be practical tips to improve the quality of water, such as rain gardens, filter strips, septic care. Other topics will be cooking green, cleaning green, energy consumption, making sense of the science, sustainable agriculture, invasive species, air quality, and recycling and packaging. So I'd better go finish my presentation for Thursday! Are you watching the lunar eclipse? It is very cold here, so I'm running outside every few minutes. 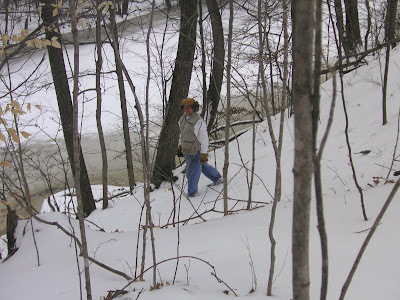 Last weekend, my husband and I spent the morning pruning the timber trees at our tree farm. I love to prune. It is an art and a science: studying the tree to determine the dominant leader, envisioning the natural balance of the tree, thinking about the affect of sunlight, and removing deer damaged limbs. It is a physically and mentally active task that has aesthetic and financial rewards. It is also much different than pruning ornamental trees and shrubs, which I also love to prune. The point to pruning ornamentals (other than topiary) is to restore it to its natural shape, to encourage new growth and blooms, and to remove diseased branches or prevent disease. The point to pruning timber is to produce the largest and straightest trunk. I took my camera planning to take before and after pictures of pruning, similar to the Purdue article linked above. After taking several "before" pictures of the first tree to be pruned and then several "after" pictures, Steve suggested that perhaps we didn't have time to both photograph and prune. Although, we did have time to hike down the river trail. It was much easier going down than going up. I was glad I had my camera though, because we saw lots of animal activity in the snow. 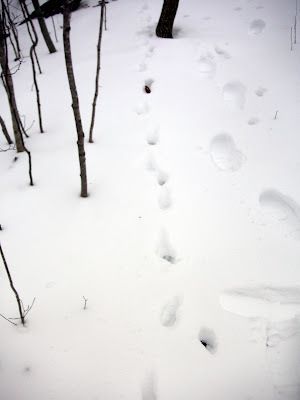 I didn't snap pictures of the bloody snow where some poor rabbit met its demise, but I did take pictures of the red fox tracks. You can tell it's a fox because of the size of the track and the track is in a straight line. Imagine keeping all four legs in a straight line while loping across woodlands. The other track isn't Bigfoot, but Steve leading the way. Starting this Wednesday and continuing for 11 weeks, I will be co-teaching this class at my church during its Prime Time Wednesday community classes. The class starts at 6:30 and ends at 7:30 and all are welcome to a join us for a meal from 5 to 6:15. This week we will be introducing the series and asking you what you want to learn. I'm having fun researching this topic, learning what I'm doing right and what else I could be doing. I think my theme will be "Take small steps and don't feel guilty because you aren't doing it all." For example, if you are driving a car that gets good mileage, shouldn't you be driving a hybrid car? If you are driving a hybrid car, why aren't you riding a bicycle or walking? Another theme is "What did Grandma do?" except she probably heated with coal or wood, which is something that you shouldn't emulate. Just as I fell into a deep sleep during a heavy rainstorm this week, I heard a loud splash and gurgle of water. Disoriented, my first thought was that the rainwater was backing up through the tub drain. I stumbled into the bathroom to see what was happening. Miss Pippi leaped from the bathtub and streaked past me soaking wet. Quickly I grabbed a towel and threw it over her. Miss Pippi, she is one curious kitty. To her surprise, Steve had not emptied the tub after using it to wet some wallpaper. Several months ago, my brother John asked if I wanted to buy part of a cow, which his neighbor had been pasturing. Usually his friend will finish off the cow with grain the last two months, but I told John I was interested only if it was totally grass fed. John assured me that this was one "happy cow" as he has been watching it all summer. If you knew my brother, you would know how funny it was for him talking about happy cows. 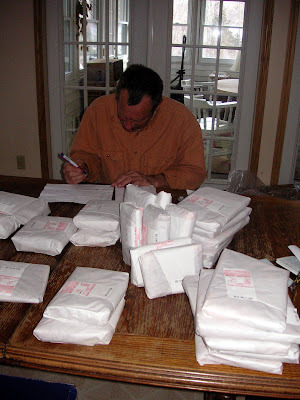 When we divided the packages several weeks ago, John told us that the woman at the packing plant remarked several times how great the meat looked and she could tell the cow was not stressed. If stress affects our bodies, why wouldn't stress affect a cow's body? The cow continued to eat grass and was butchered within two hours of leaving the field. The packing lady said that cows stress out in 12 to 24 hours and it changes the taste of the meat. Here's John deciding how many steaks each of us get. And yes, the meat is very tasty. We don't usually eat much beef, but that has been changing. Snow plus more snow plus heavy rain equals another record discharge rate for Cedar Creek. It's at 5030 cubic feet per second today. Water from our pond is flowing through the overflow for the first time since a muskrat decided to lower the pond by burrowing several new outlets. We finally sent the muskrat down the creek by using smoke bombs. The dog didn't deter him. Neither did collapsing his burrows, filling them with rocks and setting live traps. Thursday Update: It's still rising. 5120 cubic feet per second now.